Nestled between the pristine waters of the Pacific Ocean and Tuggerah Lake this luxuriously designed resort is just 15kms north of Terrigal and a 90 minute drive from Sydney. Perfect for a weekend escape conference or wedding this five star resort offers studio guestrooms and fully self-contained open-plan 1 - 2 and 3 Bedroom villas. Set amongst landscaped grounds and a short stroll from resort facilities including a Day Spa and 18 hole golf course. Just 90 minutes north of Sydney, Pullman Magenta Shores Resort is situated on the spectacular New South Wales Central Coast. Guests can explore the coastal towns of nearby Terrigal, The Entrance and Norah Head, and the area's many beautiful beaches. Spacious, light and elegantly appointed, guest rooms at Pullman Magenta Shores Resort provide a relaxed setting, perfect for both business and leisure travellers. Guests can choose from a range of accommodation options, which include Studio King rooms and one, two and three bedroom villas. 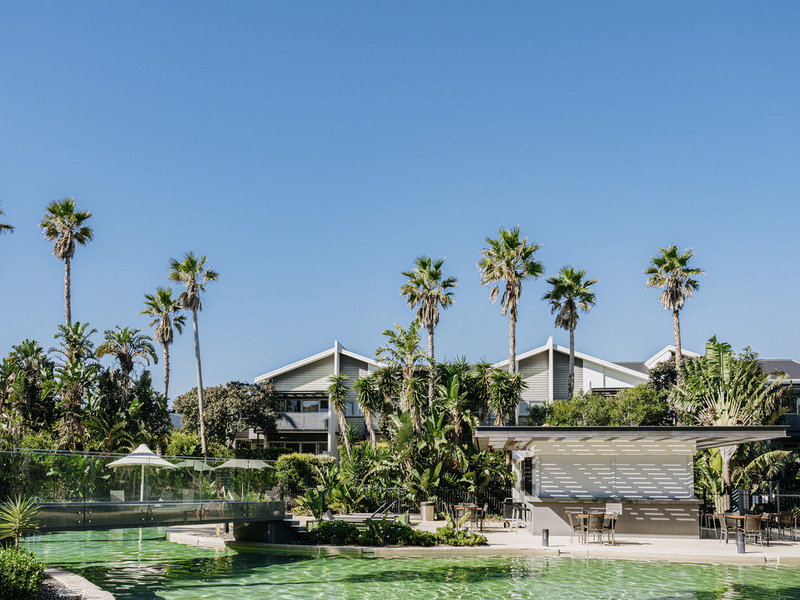 Modern and stylish, each room features an ensuite, an LCD TV with pay-per-view, a work desk, and a private balcony or terrace with views overlooking the golf course, the lagoon pool or the hotel's landscaped gardens. Shallows offers a relaxed and casual dining experience with an extensive drink menu, blended teas, espresso coffees and snack menu including a special kids menu. Stunning vistas with an ideal position overlooking the tranquil fairways of Magenta Shores Golf Course and lake.The modern Australian menu features a Mediterranean and French influence mixed with fresh local produce. Recently renovated, Shallows Bar offers a relaxed & casual all-day dining experience with Tapastry dishes to share, happy hour from 5PM & nightly specials midweek. Shallows Terrace offers al-fresco dining, featuring a Mediterranean BBQ & pizza oven. Lagoon Bar is open 7 days during the summer holiday season. Serving hot and cold drinks, refreshing cocktails, as well as fresh light meals by our fabulous lagoon-style pool. 골프장 주변의 타운하우스 느낌의 리조트로 편안하고 안락했다. 수영장도 넓고, 자연과 함께 하는 로케이션. 엔터런스랑도 가까워서 아주 쾌적하게 홀리데이를 즐길수 있었다. Awesome getaway spot. Close to the Enterance and belonging to the beautiful golf club. Kind and friedly staff. Had fun!!!!! 2주 연속 월~화 1박 2일 3베드룸 빌라&amp;골프를 했다. 전반적으로는 좋았으나 3베드룸 빌라의 킹베드 쿠션은 너무 안좋아서 잠을 쉽게 이루지 못하였고 잠자리가 불편했다.104호 그리고 히터소리가 너무 커서 예민한 사람들은 히터소리가 크다고들 했다. 그러나 모바일 충전기를 놓고 갔으나 이번주 월~화에 단체 28명 1박 2일 골프 잘 돌려받아 기분 좋았다. 그런데 히터소리가 크다고 한 사람들이 있었다. 그래도히터는 따뜻하고 좋았다. 조용히 휴양하며 쉴수있는 편안한 곳이었습니다. 주방시설이나, 내부 시설 모두 깨끗하고 넒고 쾌적한 환경으로 가족과 함께 하기에 더없이 좋은 곳이었습니다.